Image Above, Detail from Dessel’s "Expat Repat. Installation. Linen fabric, Archival linen tape, Archival ink. 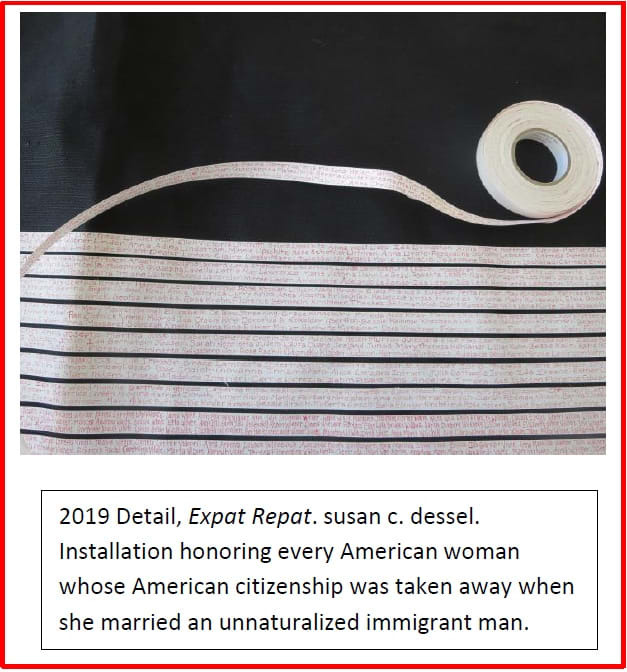 About susan c. dessel’s work, “Expat Repat”. Any woman who had lost her American citizenship through marriage to an alien eligible for citizenship was consequently allowed to apply to be repatriated. Curated by Haifa Bint-Kadi and sponsored by the Sisterhood of Salaam Shalom, the work in this group exhibit presented the artists’ perspectives on building bridges and fighting hate, negative stereotyping and prejudice. Among the work exhibited was Artist susan c. dessel’s Installation PIECES OF PEACE: thirty-six hand carved Olivewood pieces with handwritten excerpts from the Oslo Peace Accords. Curated by Dorit Jordon Dotan, this exhibit of work by twenty-two North American-based artists offered perspectives on the conflict in the Middle East. Dessel’s Installation PIECES of PEACE was on view to the public here at the Evanston Art Center for the first time.